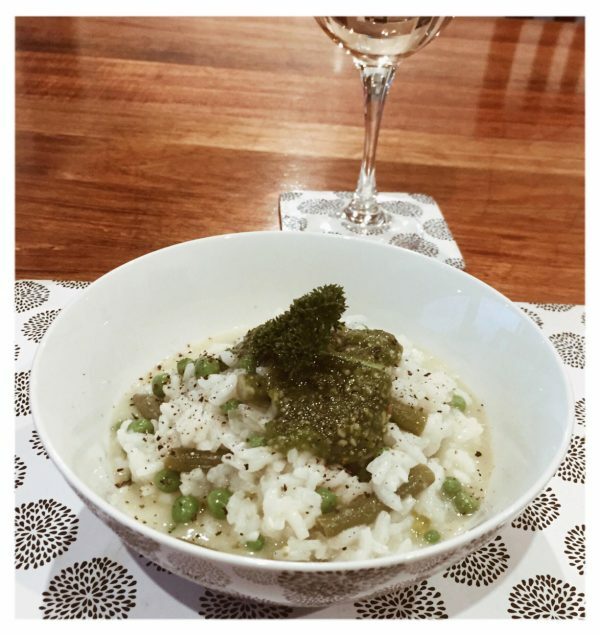 This Green Bean Risotto is a wonderfully easy meal with the delicious hint of pesto. It is perfect for a meat-free Spring dinner with a side of fresh salad but could also be incorporated with a favourite cut of meat. The method below is for traditional cooking but it doesn’t take long to get it started then you leave it to cook in the oven. If you have a Thermomix, you can make it a tad quicker. Simply change the amounts of ingredients with those outlined in the Thermomix Everyday Cookbook’s Mushroom Risotto recipe, and substitute the mushrooms for the beans and peas. Whilst you can absolutely use bought pesto, you could make your own. If you have some leftover organic spinach from your The Organic Place order, it’s quick to whip up. In this recipe I instruct you to mix the pesto through at the end of the cooking process but because our children are not fans of pesto, we added it individually to our bowls. Either way works and of course as long as everyone is happy, that is the main thing! Heat the oil in a flame proof casserole dish over medium heat. Add the onion and garlic and stir until softened. Next, add the rice and wine and stir for a few minutes. Put in the stock paste, water and green beans. Cover the dish with a lid and bake for 25 - 30 minutes in the oven. When you remove the dish from the oven, add in the salt and pepper, pesto, peas and parmesan. Serve on its own, with a side salad, or favourite cut of meat. Enjoy! This entry was posted in Recipes, The Organic Place and tagged Certified Organic, Family, food, green bean, Health, Healthy, Healthy Eating, Kids, meat free, Organic, Organic Foods, Pea and Pesto Risotto, peas, pesto, recipe, recipes, risotto, Seasonal, Seasonal Produce, Spring, The Organic Place, Vegetable, Vegetables.